As of 1st of September 2017, a new amendment to the act will be in effect on the use of virtual cash registers by Act no. 180/2017 Coll. According to the current legislative regulation, the VCR could only be used by an entrepreneur on the condition that within one calendar month the number of cash vouchers issued by the VCR did not exceed 3 000. Given that the limit was linked to the entrepreneur when setting up several VCRs, the total sum of the documents issued by all VCRs together should not have exceeded 3,000 within one calendar month. The amendment completely abolishes this restriction and entrepreneurs may use VCR as of 01.09.2017, regardless the number of issued cash documents per month. 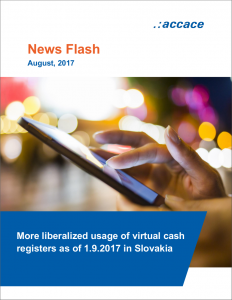 Moreover, if in the past the Financial Directorate of the Slovak Republic terminated the usage of the VCR due to exceeding the limitation of cash vouchers and the entrepreneurs had to start using the electronic cash register, they are enabled to use the VCR again from 01.09.2017. The procedure for VCR re-registration is the same as for the first application of VRP usage under §7a of the ECR Act.